What Do You Do When A Shark Follows You? Paddling off Tomales Point one calm and balmy evening in early October, I heard a swishing noise. Looking over my shoulder, I saw a shark’s dorsal fin break the surface heading straight for me. I paddled furiously, but the shark kept gaining on me. I paddled evasively on the right side only and the shark followed. I paddled evasively on the left side only and the shark followed. I caught up to Don Fleming and yelled "Help! There's a shark following me!" I don't think Don appreciated my new-found friend; he started paddling toward the Bay. Don and I set a new world record paddling speed on the scrupper-pros. Luckily the shark lost interest and disappeared. After blindly following basic instinct to avoid a charging animal, my first rational thought was to grab the camera and get a picture. My second thought was maybe I shouldn't run, that might only encourage a chase. Lucky for me I followed my instincts and paddled evasively. If I had stopped, I think the shark would have hit the kayak and possibly knocked me in the sea. I always thought if attacked by a shark that it would be from underneath and I wouldn't see the shark until the last moment. I think I only saw him because the shark had to deal with a moving target. Don says it was a 10 foot or smaller shark, but it looked like a 35 footer from my deck. Shark Encounter "A human is approached by a shark which leisurely circles and/or slowly swims past the subject without any aggressive behavior exhibited by the shark"
Shark Attack "If an impending attack is only avoided by evasive maneuver, this too shall be classified as an unprovoked shark attack"
Many thanks to Ralph Collier of the Shark Research Committee for the shark encounter definitions. Please report all shark encounters to http://sharkresearechcommittee.com They hope to eventually be able to determine cause and effect for kayakers. It was a beautiful evening for sea kayaking; unfortunately, I have learned that sharks also like these conditions. It makes sense to me that a large fish would not like rough conditions. 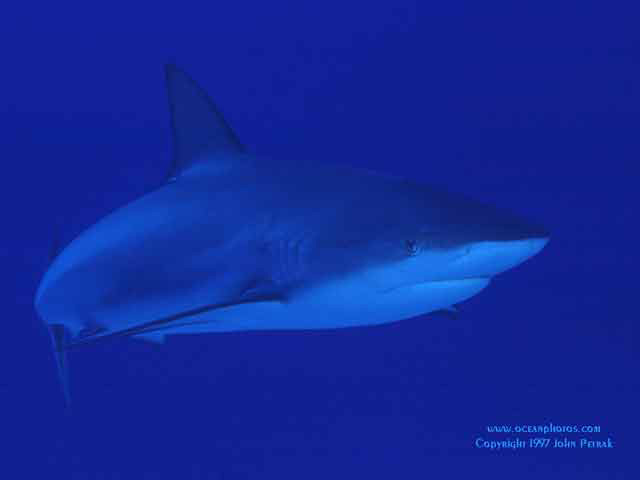 "The interpretation of shark behavior will long be debated by those that study elasmobranchs. Your question "If a shark comes right at you is this an attack?" is dependent on the animals actions while approaching you. It might be slowly and leisurely approaching you or it could be swiftly coming 'head-on.' White Sharks frequently swim with their backs above the surface and use 'spy-hopping' to visually observe above the surface. The speed at which the shark approaches the subject might provide some clues as to its motivation. In regard to what actions should be taken by the subject of a shark encounter or attack, there are numerous and conflicting opinions. For years divers have told me that when they turned quickly and saw an approaching White Shark, they almost always, turned, reduced speed, and leisurely swam off. There were a couple of instances when the shark's were aggressive and the subjects were forced to retreat into kelp forests and canopies to get away from their assailant. Whether turning to face the oncoming shark would have caused it to turn away or not is impossible to determine, as you know. However, paddling away might have contributed to the shark's continued interest in your kayak. As far as your friends kayak being the reason for the shark's departure, I would tend to say no. Earlier this year a large White Shark (5 meter +) surfaced in the center of a group of kayakers off Catalina Island. There were 15 kayaks scattered within a circle about 10 meters in diameter. The shark rose up, much like a surfacing submarine, in the center, near three young kayakers, remained almost motionless momentarily, before submerging. It is possible the shark might have come up for a closer look at a silhouette it was unfamiliar with, when you started moving and increased its curiosity. I wish I could be more helpful, but without observing the shark when it first became aware of you and your kayak, makes interpretation of its motive almost impossible. Even when observed, as I mentioned earlier, there is much conjecture amongst researchers as to the causes and effects of predatory behavior. Please know that you may use any of the material I have posted on my site for any of your educational meetings or speaking engagements. For future occasions, let me know if there might be something specific that would assist in your presentations. I'll do my best to help you out if I can. Giving credit to me is not as important as asking your fellow kayakers to report any shark encounters they, or someone they know, might have while cruising our coast. The more data we can compile on these incidents the more likely we will eventually be able to determine cause and effect for kayakers." Many thanks to Ralph Collier! Thanks to John Petrak for the great shark background!